Influenza is an infection of the nose, throat, and lungs caused by influenza viruses. There are many different influenza viruses that are constantly changing. They cause illness, hospital stays and deaths in the United States each year. The flu can be very dangerous for children. Each year about 20,000 children younger than 5 years old are hospitalized from flu complications, like pneumonia. Flu illness can vary from mild to severe. While the flu can be serious even in people who are otherwise healthy, it can be especially dangerous for young children and children of any age who have certain long term health conditions, including asthma, neurological and neurodevelopmental conditions, chronic lung disease, heart disease, blood disorder, diabetes, and weakened immune systems due to disease or medication. Flu viruses spread mainly by droplets made when people with the flu cough, sneeze or talk. Less often, a person might get the flu by touching something that has the virus on it and then touching their own mouth, eyes or nose. Symptoms of the flu can include fever, cough, sore throat, runny or stuffy nose, body aches, headache, chills, fatigue and sometimes vomiting and diarrhea. People with flu may be able to infect others by shedding virus from day 1 before getting sick to 5-7 days after. However, children and people with weakened immune systems can shed virus for longer, and might be still contagious past 5-7 days of being sick, especially if they still have symptoms. How can you protect your child against the flu? To protect against the flu, the first and most important thing you can do is to get a flu vaccine for yourself and your child. Vaccination is recommended for everyone 6 months and older. Another way to protect babies is to vaccinate pregnant women because research shows that this gives some protection to the baby both while the woman is pregnant and for a few months after the baby is born. What are some other ways can I protect my child? Cover cough and sneezes with a tissue. Stay away from people who are sick. 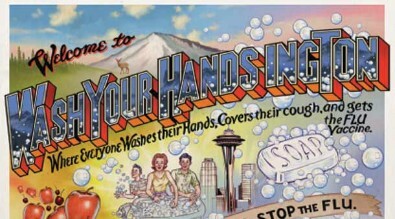 Wash hands often with soap and water (for as long as it takes to sing the ‘Happy Birthday’ song twice). Avoid touching your eyes, nose and mouth. Keep surfaces like bedside tables, surfaces in the bathroom, kitchen counters and toys clean.